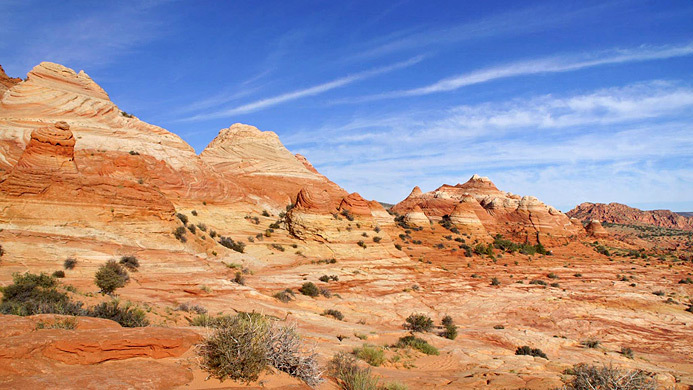 The North Coyote Buttes permit area covers a relatively narrow, one mile long section in Utah, incorporating the northern end of the main ridge, and a wider two mile part in Arizona, south to the vicinity of Top Rock Spring. There are some photogenic places outside the restricted region, including the North Teepees and South Teepees, on the east side, but the normal route to these areas crosses the zone so effectively permits are still needed. 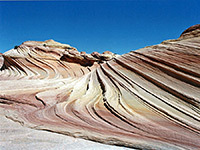 The Wave is by far the most popular location in North Coyote Buttes and for most visitors is the only site they see. Colorful, swirling strata in many shades of pink, red, yellow and white are found all along the east side of the ridge but this location is certainly the best. The Wave is situated at the foot of the northwestern slope of Top Rock, an easterly, outlying part of the ridge formed of white Navajo sandstone, and near the mouth of a small ravine running north-south through the hills (Sand Cove), which also has much photogenic scenery. The 2.6 mile cross-country route to the Wave was traditionally somewhat hard to follow, but has become easier with increased use, and is partially marked by cairns. The terrain is not too difficult, with only gentle elevation changes; the main potential problem, in summer, is the heat, as temperatures can exceed 100°F, and there have been several deaths in recent years, involving people unprepared for desert hiking. The terrain is mostly firm rock but some sections are over soft sand. The usual time taken for the walk is between one and two hours. From the Wire Pass parking area, the path passes through a metal gate, crosses the wash, runs alongside for a while then turns to the right (east), up the side of a hill on the outside of the first big bend. At the top of the slope is the Coyote Buttes trail register, after which the path follows a disused, sandy road over a plateau and down to another dry wash. Beyond here the land is rockier and the trail not as well defined; the route is across the wash and up the far side to the top of a small ridge, veering left a little to maintain elevation, keeping the higher ground to the south. 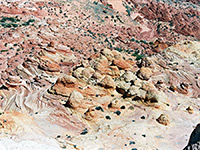 Over the ridge, the land opens out to reveal a big expanse of sand and slickrock, with a long, high ridge to the right (the northernmost part of Coyote Buttes), a vast open area of sand and scattered rock domes in the middle distance and larger, more concentrated red rocks to the left, rising up to a mesa which forms the edge of Buckskin Gulch. Directly ahead, just left (east) of the main ridge and a little less than 2 miles distant, the land rises to a higher summit with a small but distinct dark notch about half way up, which is directly above the Wave and so provides a point to aim for. The remainder of the hike is along the rocky slopes below the main ridge, descending near the end into another sandy wash (Sand Cove) then up to the Wave itself; there are several choices as to the exact route. A thousand feet southwest of the Wave and maybe 100 feet higher is another pretty formation designated Wave 2, or the Second Wave - more curvy sandstone crossed by small fins, best pictured early or late in the day. But anywhere along the ridge may reveal equally wonderful formations so it is worthwhile wandering at random around the nearby cliffs and gullies. East of the main ridge the land soon becomes predominantly flat and sandy, interrupted only by occasional outcrops of small, sandstone domes - most prominent are the North and South Teepees, 'teepees' being the general name given to the conical sandstone mounds typical of this region. One more recent discovery, a third of a mile northwest of the Wave, is the Dinosaur Dance Floor, a group of over 1,000 dinosaur footprints and a few tail drag marks, preserved on top of a layer of whitish Navajo sandstone. 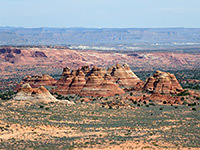 There are several arches in North Coyote Buttes, some only recently identified. Top Rock Arch sits high on the narrow northernmost projection of Top Rock, about 1,000 feet south of the Wave, reached by climbing slickrock in the vicinity of Wave 2. Melody Arch is another thousand feet south, past a sandy cove known as The Alcove, while the somewhat hidden Hourglass Arch is a small feature on the rim of steep cliffs, 900 feet due west. Perhaps the most photogenic is Dicks Arch, a slender, curving, red rock span on the west side of the ridge, about 200 feet south of the stateline.